Scooter rental startup Bird Rides is now valued at $2 billion after a recent $300 million funding round, according to a source close to the matter. 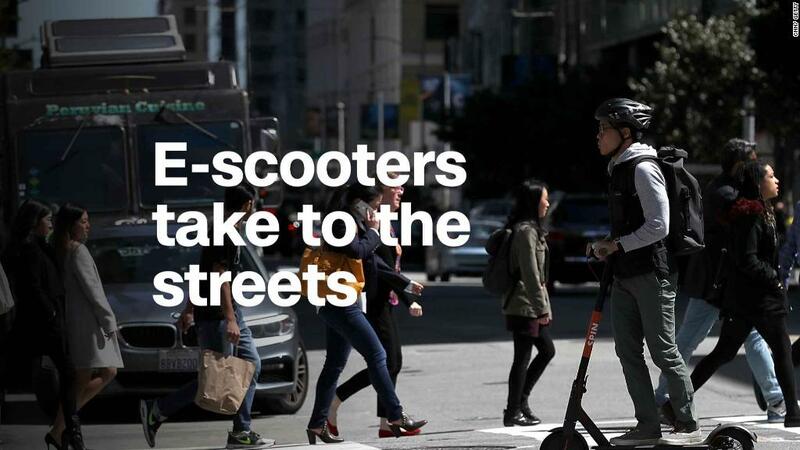 That's a fast rise for the Los Angeles-based company, which launched its first scooter pilot program in Santa Monica, California, last September. It now operates scooter shares in 22 US cities. "The investors love the growth ... and the numbers, but I think they also like the mission of Bird," said CEO and founder Travis Vanderzanden told CNNMoney. "People have been trying to find ways to get Americans out of cars for a long time, and we think Bird can have a big impact." The scooters, which can go up to 15 miles per hour, give city residents an alternative commuting option. The scooters, rented via an app, cost $1 to unlock and about $0.15 to ride per minute. They operate on the same lithium ion batteries that cell phones and tablets use. An electric scooter belonging to the Bird company is waiting for a rider on a street of downtown Washington, DC. "What we learned over time is that people are not only having fun on Birds and using them to explore cities, but they're actually using them to commute to and from work," said Vanderzanden, who was once the COO of Lyft and later a VP of growth at Uber. But not everyone is onboard with the electric scooter craze. Scooter startups like Bird allow riders to park them anywhere that doesn't block pedestrian walkways. However, residents in cities such as Los Angeles say they often litter sidewalks and pose a danger to pedestrians. On Instagram, #ScootersBehavingBadly showcases photos of electric scooters blocking traffic and parked on top of city benches. Some cities like San Francisco and Denver have even banned them until new regulation is passed. Vanderzanden said he believes the scooters should be regulated, too. "We want to work with cities and figure it out," said Bird's Vanderzanden. "It's been hard for [cities] to see this wave of electric scooters coming and so there's really not a lot of laws around the electric scooters yet. We're actually supportive of regulation." 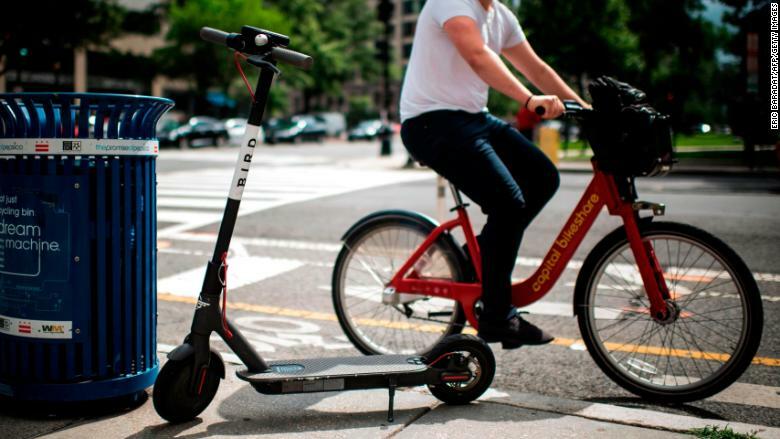 Although Bird was among the first scooter share companies to market, it faces increasing competition from companies such as San Francisco-based Lime, which operates scooter and bikeshare programs in 70 cities. On Monday, Uber announced it is partnering with Lime to offer scooter rentals within its app. Meanwhile, Lime put hundreds of the scooters on the streets of Paris last month. "The numbers have been crazy [in] the first few days," said Arthur-Louis Jacques, the head of Lime in France. "We put a few hundred scooters, and it's not enough. We need to [add] more because people are looking for them." Lime said one million people in the US already use its bike and electric scooter sharing services. The company raised $135 million dollars from investors since its launch a year and a half ago, according to Jacques. He declined to share Lime's valuation. Paris Mayor Anne Hidalgo approved Lime's scooter operation in the city, as long as riders stay on the road or city bike lanes. "For the moment, the scooters that I see are properly parked," she said. "I have yet to see any scooters on the sidewalks." She emphasized how this proper use is key to making the scooter system work in Paris. "If there were any [on sidewalks], they would be sanctioned," she said. "You don't have the right to ride on the sidewalks and to block the movement of pedestrians."